Tasty, unique hors d’oeuvres set the right impression at the beginning of your event. But doing them well takes some work. From budget to staff to timing, here’s everything you need to know to create amazing hors d’oeuvres and appetizers. Before you decide on your menu, determine your budget. Be realistic and flexible. Local, fresh, and simple is always best. Form friendships with area food producers. If you have a relationship with a beet farmer for example, borscht shots could make a nice bite (err… sip). The general rule for light appetizers is two to three bites per person, per item, and two beverages each. 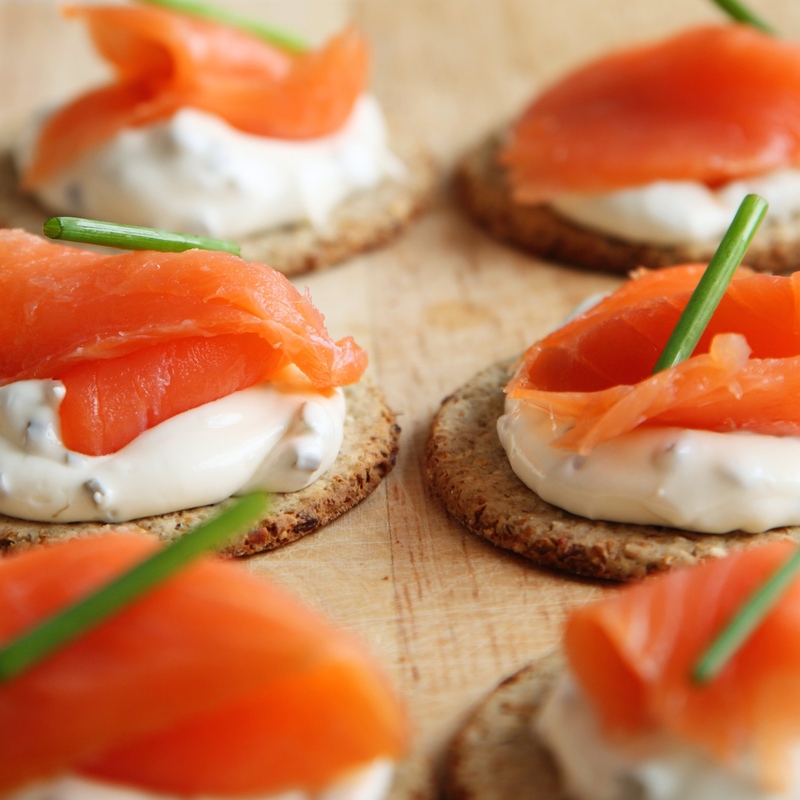 This means if you have 100 guests you will need 300 of each bite-sized appetizer (usually at least three different items). Not every item will be super popular, so mix and match quantities. Depending on the complexity, you can usually get away with one person doing the food prep for up to fifty people, so you are looking at a team of four to five. Plan to have at least one person serve each item you offer. The menu for an event with hors d’oeuvres can be challenging. Seek ingredients that can be prepared in bulk ahead of time that will retain their flavor and freshness. Consider putting them together in batches to ensure quality. Keeping the recipes simple will not only help cut your prep and labor time, it will reflect in your food costs as you’ll need less. Make sure your servers know about what they’re offering so they can explain where you sourced the ingredients. 1. The timing for your event will determine food and beverage needs. If you’re only serving appetizers, plan the event at least an hour after a typical meal period, so guests have a chance to fill up first. Your attendees will get to hang out a little longer and savor your appetizers rather than try to make a meal of them. 2. Bulk up on your appetizers if you are serving alcohol. Also, limit the size of each alcoholic beverage to ensure pacing for your guests. Over ordering and over pouring are top event planning mistakes. Over ordering increases costs dramatically and over pouring can increase the amount of inebriated and obnoxious guests. 3. Dress the part, and set clear attire rules for staff. The service staff should dress in a uniform manner to make it obvious that they are there to serve the guests. No need to go super fancy; if your event is casual, a black t-shirt, jeans and name tag works well. 4. Educate your staff on the preparation and ingredients of each bite. The more your servers know, the more accommodated your guests will feel should they have allergies, dietary preferences, or are just curious. It’s also impressive for your staff to be knowledgeable about the food and wine. 5. Pace your trays and rotate the items on them regularly. Create paths or walkways with tape for your servers to follow. This ensures that there is even coverage throughout the venue, and you can rotate the different appetizers, one on each path. If you assign a specific person to each path it will be easier for them to rotate trays on their own. 6. Set clear expectations for attendees regarding the style of service. Spend time “on the floor” at your event to chat up your guests and alleviate any frustrations. 7. Place receptacles for napkins and other refuse in obvious locations throughout your venue. There is nothing worse than carrying around a piece of trash while you are trying to mingle and participate in an event. Receptacles should be plentiful and clearly marked for your guests. 8. Be a ringleader. When you are hosting an event with passed appetizers, you’re directing traffic and hosting at the same time–unless you have hired a catering company, and even in that case, you still need to keep an eye on the food. Set reminders on your phone and stay organized. 9. Work with your team to talk, taste, and teach in an open and friendly manner. In the midst of planning an event? We’ve got great event tips and resources for every type of event, from classes to festivals. Tags: event catering, event menu, food and beverage.